The Bazaar in the SLS Hotel is a magical carnival of sensory stimulation, a multi-circus act of vibrant colors, outrageous artistic concepts and powerful flavors that saturate every cell in your body. It’s an exciting world that takes you away to a wonderland mesh of design and taste. From the moment I entered the swank Bar Centro until my last sip of herbal tea in the rococo Patisserie, I felt like I was sleepwalking through a multitude of wild and fantastic dreams. Every section of the Bazaar has a different design concept, but all are theatrical masterpieces of Phillip Starck. Bar Centro, with its flourescent yellow background, is dark and mysterious. It’s furnished with leather couches lined with expensive suede throws, velvet pillows, tall banquettes that hide whispering lovers from the crowd, and a large communal table with spinning movie projection discs glowing softly in the darkness. The bar gets creative with their cocktails, using liquid nitrogen and organic emulsifiers to create an original spin on traditional drinks. We toasted the commencement of our bizarre Bazaar journey at the Bar Centro with a bottle of Charles Heidsieck Brut Réserve champagne. A bold fruity richness with a zesty citrus finish. C’est magnifique! To the right of the bar are tall glass vitrines showcasing select objects for sale by Manhattan design shop Moss. Each case houses a unique array of fun toys and household items, from squished up teddy bears to enamel combs to porcelain birds to decorative silver plates. Also for sale are enlarged candid paparazzi photos of famous celebrities at their best and worst (Brad Pitt with Zahara in the park to Gwyneth Paltrow dodging the lens with an outstretched hand). Each item makes you wonder…why, what, when, where, who, and how??? 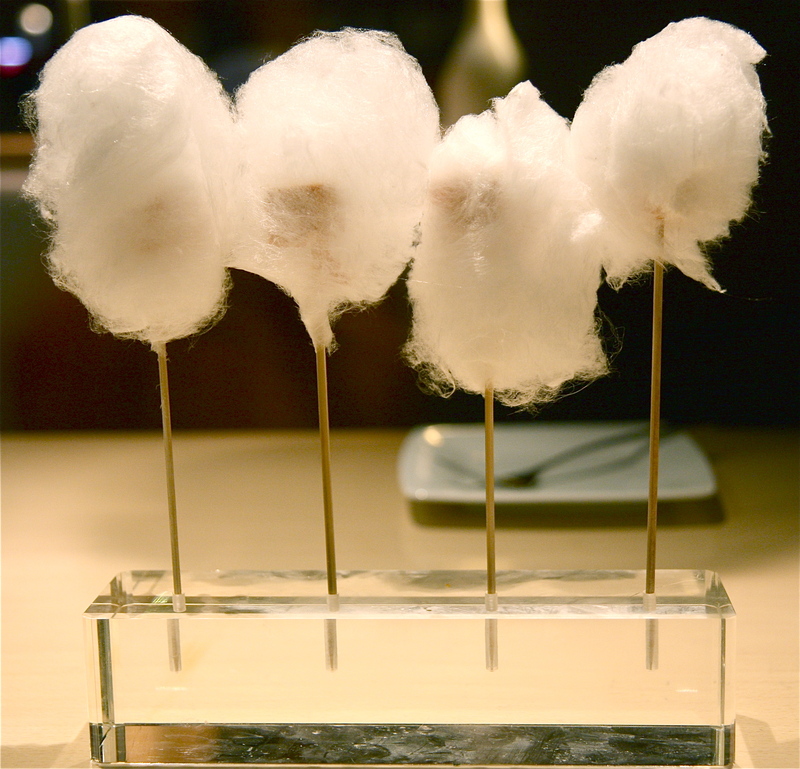 Famed Spanish chef José Andrés, who trained with Ferran Adrià of El Bulli, has 2 sections in his restaurant. The contemporary Blanca side, where we sat, has pristine white and pink armchairs and glowing lampshades. There are large wonderful photos of bodies in motion, playfully displayed throughout the restaurant. The traditional Rojo side, set behind large grey draping curtains, plays on black and red, with bold chalk drawings of animals and vintage photos of Spanish matadors. This is the side where you can see the busy open kitchen busting out the wild creations on the extensive menu. We ordered the chef’s tasting menu along with a beautiful bottle of 2004 Chateauneuf du Pape, Tardieu-Laurent from Rhone, France. 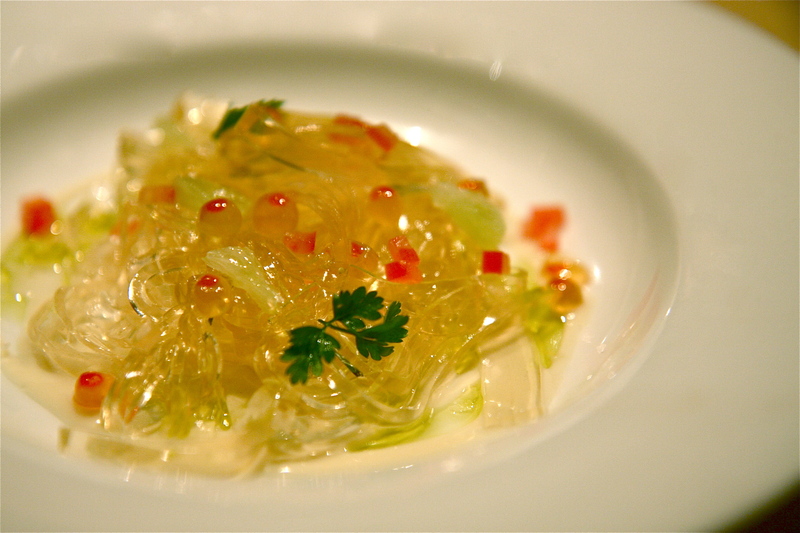 I embarked on this mesmerizing molecular gastronomy tour with 2 professional chefs and a refined foodie friend. It was the perfect set up for a perfect evening. For starters, my favorite creation of the evening, the Philly Cheesesteak. 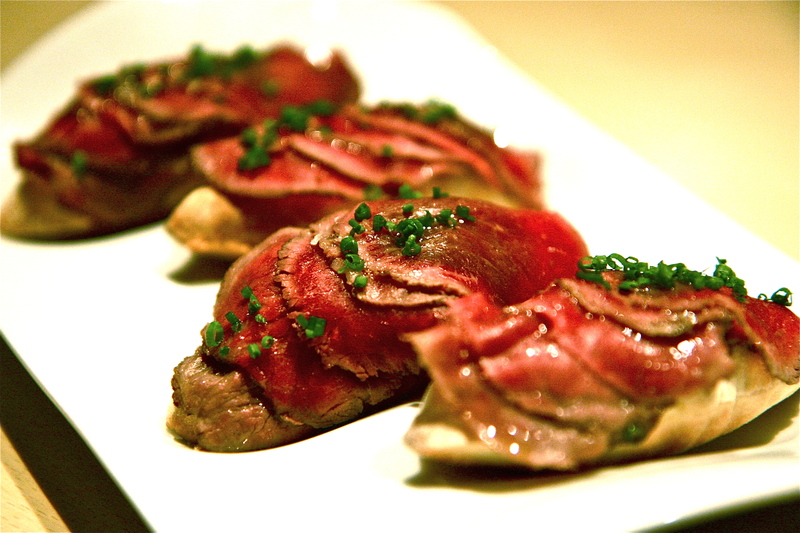 Seared tender slices of Wagyu beef on oval shaped air bread with melted cheddar cheese. The air bread is a hollow light thin crust of bread that contains dripping melted cheese. This was one of the most sensational dishes that I have ever tasted in my life. The delicate lightness of the air bread coupled with the wagyu beef that melted just as fast as the warm cheese penetrated deep into my taste buds, making me purr with delight. Next we had one of my absolute favorite foods in the whole world. I have dreamt of this day when I would finally be reunited with Jamon Ibérico de Bellota. 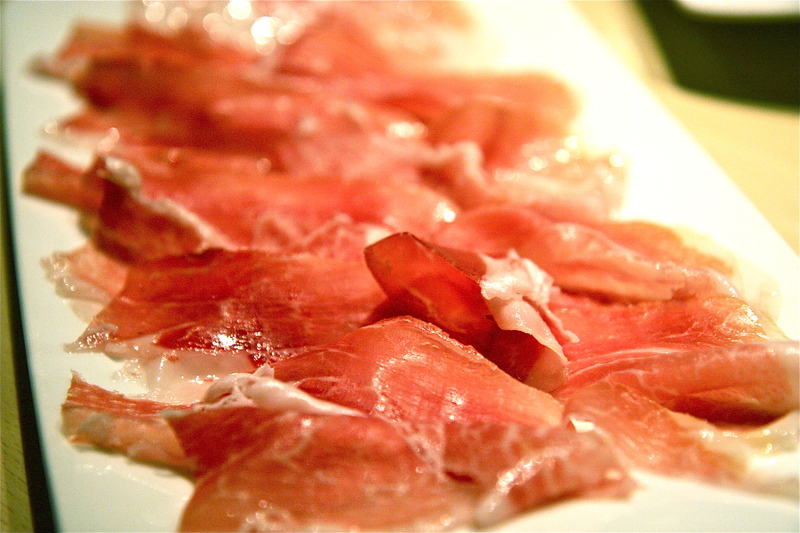 This is the most prized cured Spanish ham in the world, made from free range black Iberico pigs raised on acorns. Due to import regulations, The Bazaar is one of the few places in the United States where you can eat this. The woodsy aroma and deep sweet flavor of the glistening marble fat that melts on your tongue is indescribable. 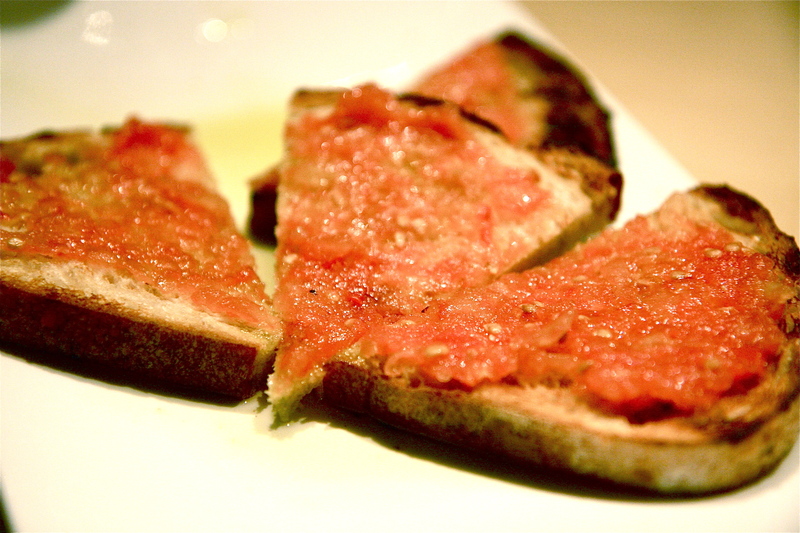 Pa’amb tomaquet, a traditional Catalan tapas of ripe tomato, Manchego cheese and garlic rub on toasted bread, was the perfect complement to the jamon. 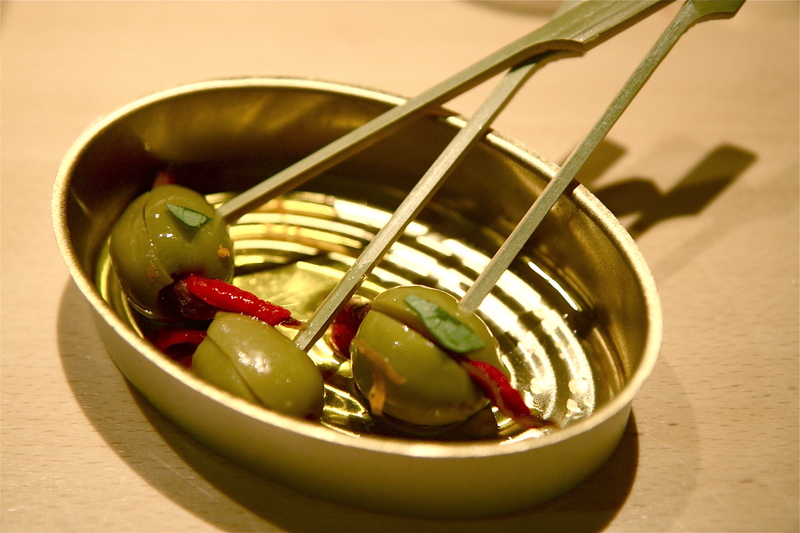 Next we had a signature Ferran Adrià dish, the traditional and modern olives. 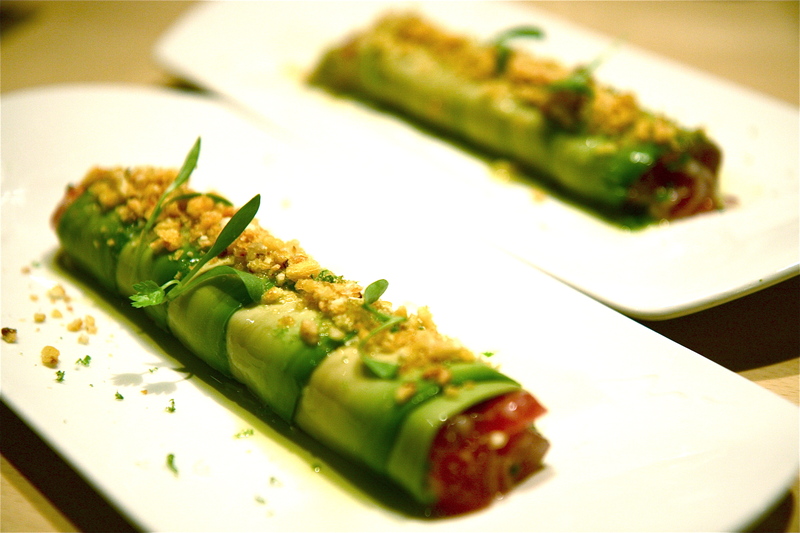 First we sampled traditional olives stuffed with roasted piquillo pepper and anchovies. It was nicely briny and salty, and the green olive flesh was meaty and succulent. 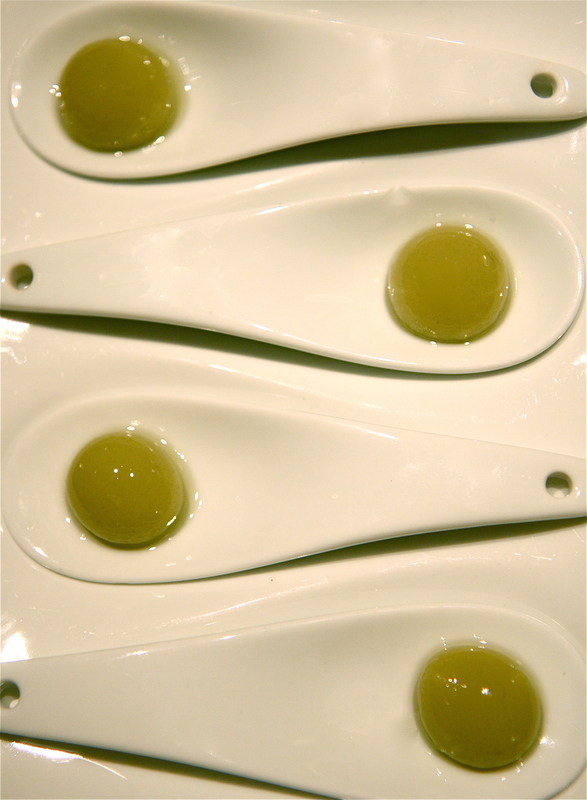 The modern olives, made by spherification, were served tableside by our server. He came over with a glass jar containing perfectly round green blobs floating in olive oil. He scooped them out with a small ladle and very carefully placed them on white porcelain serving spoons. It’s pure olive essence packed inside a thin delicate membrane that bursts inside your mouth with only a slight amount of pressure. 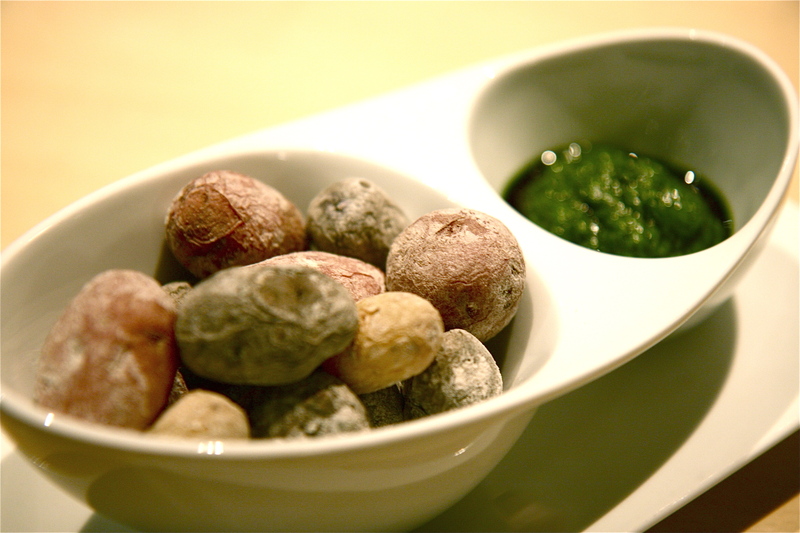 Papas Canarias, salty wrinkled potatoes prepared Canary Island style with mojo verde sauce. I loved the soft velvety texture of the potato skins. The potatoes were perfectly cooked inside, and the green parsley, cilantro, garlic and olive oil sauce was light and fresh. 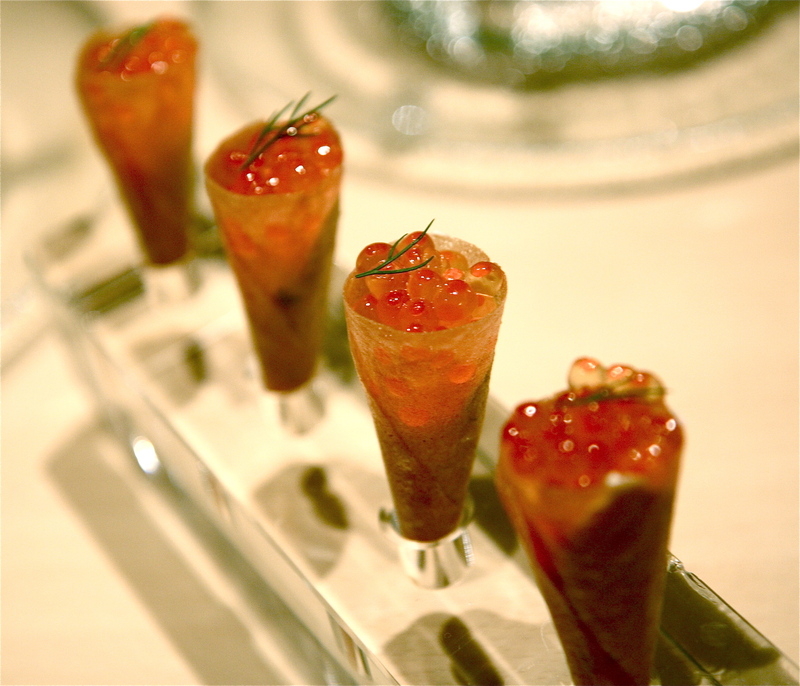 Next was a playful presentation of soy marinated salmon roe cones with crème fraîche and dill. The crepe cones were thin and delicate, and the roe was both sweet and salty. A delightful bite of bursting roe bubbles and sour creaminess! The following dish was a very bizarre take on the shrimp cocktail. 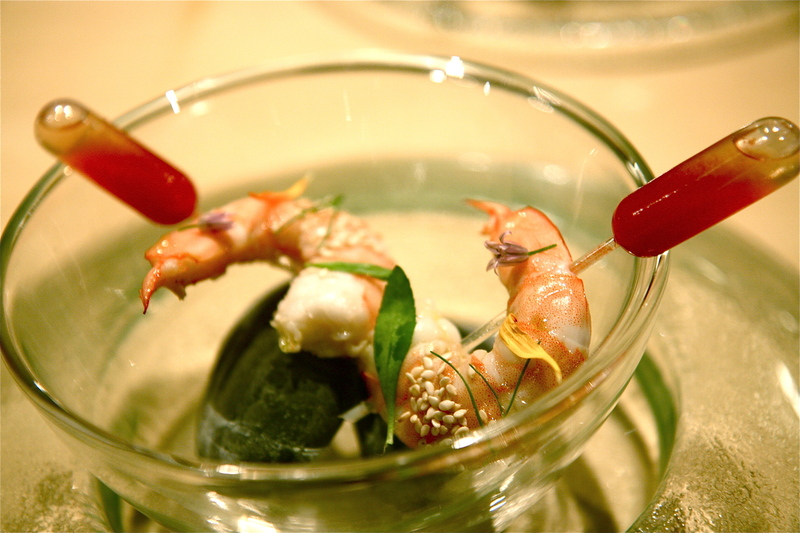 Plastic pipettes containing cocktail sauce pierced through the shrimp flesh garnished with chive flowers, dill and sesame seeds. Our server instructed us to take small bites of the shrimp while squeezing some of the cocktail sauce into our mouth at the same time through the pipette. I wasn’t a big fan of this dish. It was too much work for too little taste. 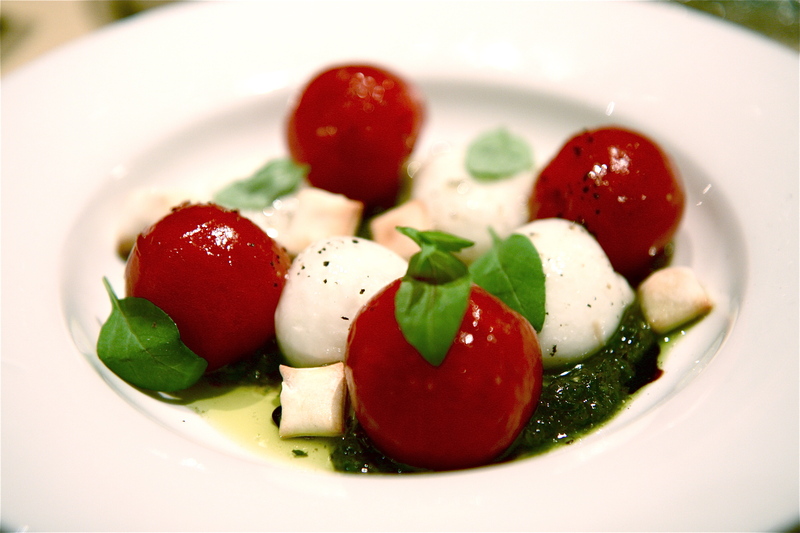 I really enjoyed this next modern Caprese dish. Liquified mozzarella balls (same concept as the modern olive spheres) with roasted peeled cherry tomatoes in a basil sauce. We were instructed to eat the mozzarella balls, cherry tomato, basil sauce and crackers all in one bite, and boy was it a superb and delightful bite. The cherry tomatoes had a slight vinegary acidic tone, going well with the dark earthy genovese, crunchy crackers and soft liquid texture of the intense mozzarella balls. Tuna ceviche and avocado roll with cornflower chips and micro cilantro. A classic combination of avocado and tuna that can never go wrong. It’s rich, creamy, and flavorful. The cornflower chips added a wonderful crunchy texture to the dish. 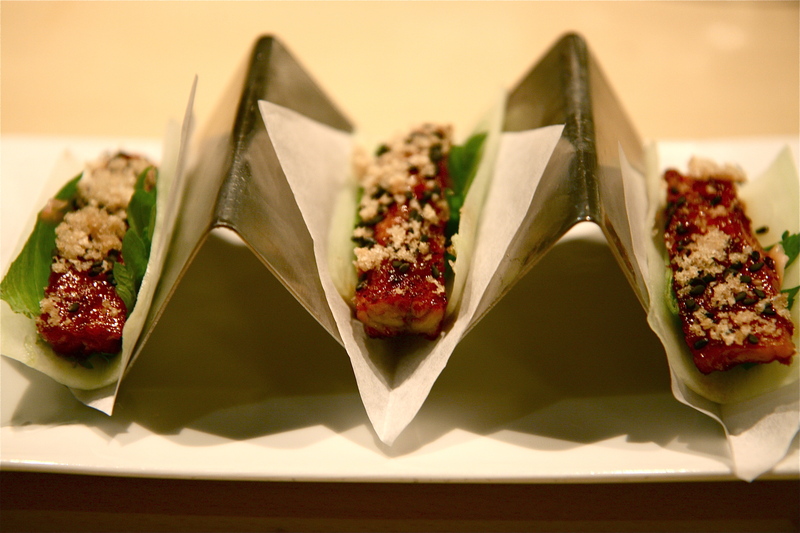 Japanese tacos with grilled eel, shiso leaves, cucumber, wasabi and chicharron. I didn’t care much for this dish, it was very predictable. Miso linguine with tomato, salmon roe and lemon. The dashi flavor of the noodles was very strong, maybe a bit too strong for me. The textures of this dish were delightful though, with the slurpiness of the slippery noodles and the bursting salmon roe. It served as a nice refreshing palate cleanser before the heartier meat dishes. 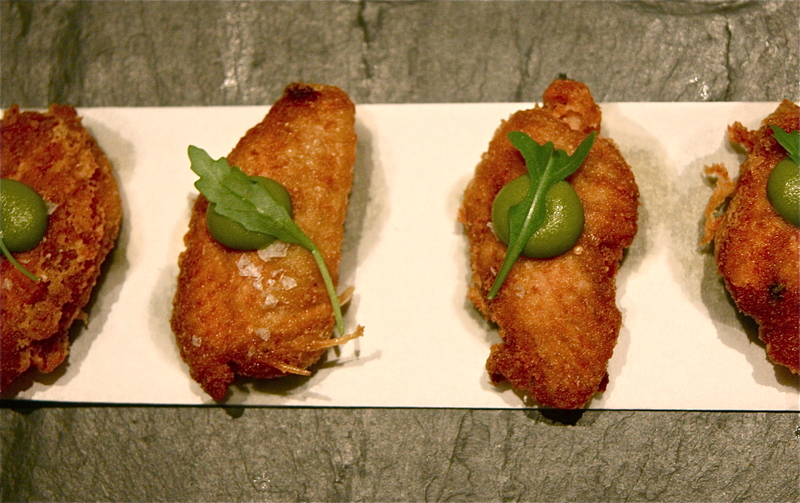 I loved the boneless chicken wings with green olive purée. First of all, how can you go wrong with fried chicken? They were crispy and flavorful on the outside and juicy on the inside. One of the best executed dishes of the evening where we could really appreciate the true flavor of the food was the oven roasted cippolini onions with clementines, passion fruit and pumpkin seed oil. 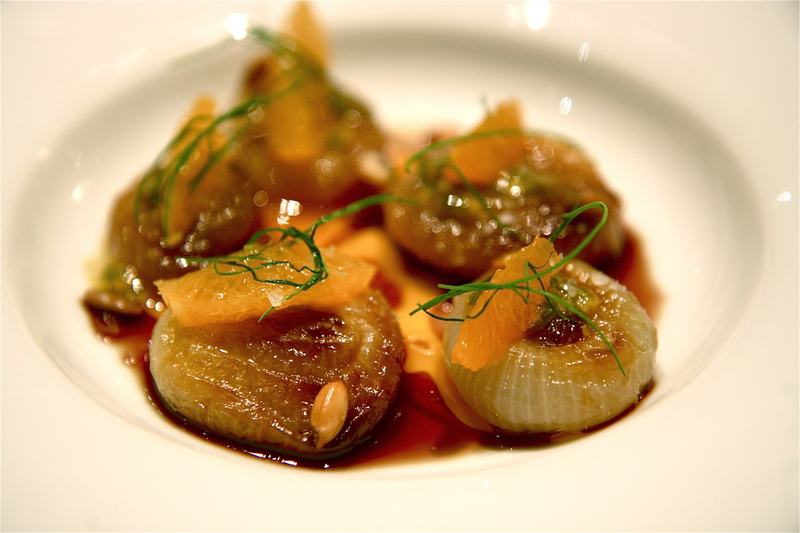 The onions were wonderfully caramelized, and their dense sweetness paired nicely with the tart clementines. The braised veal cheeks with California oranges was another delightful savory dish with that perfect balance of citrus tartness and rich veal jus. 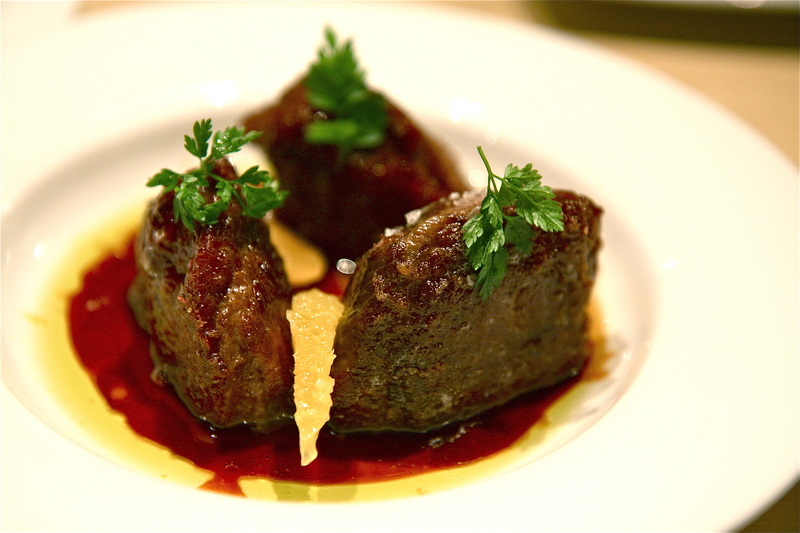 The braised meat was extremely tender and melted in my mouth. To finish off the dinner, sautéed cauliflower ‘couscous‘ with quinoa, pomegranate, dried raisins, pine nuts, cauliflower purée, harissa and lemon. The ‘couscous‘ here is actually made from finely chopped cauliflower florets. 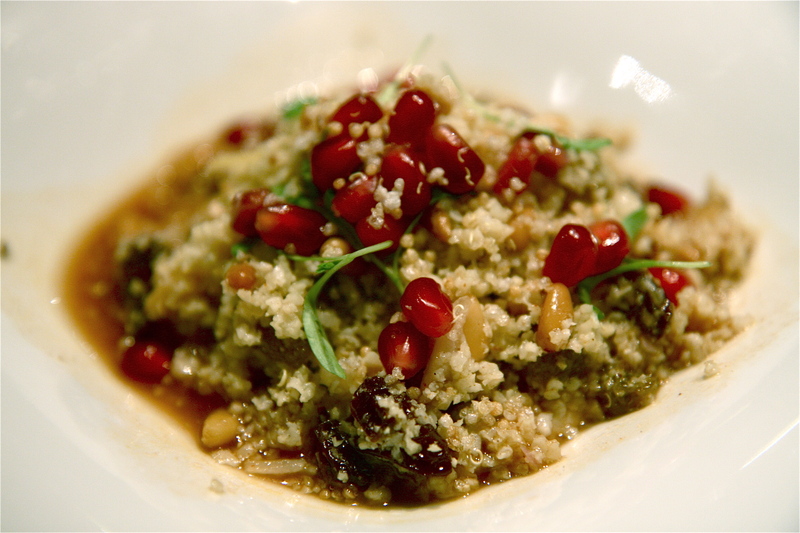 The sweet and smokey Moroccan flavors of this dish went well with the braised veal cheeks. Wow, we ate a lot of fine dishes. And we still had room for dessert! After a quick kitchen tour we went to the charming Patisserie for sweets. The pink and white dessert counter is lined with beautiful glass jars and containers filled with delightful colorful treats that are visually pleasing. A true Alice in Wonderland experience. The patisserie offers exciting sweets such as passion fruit marshmallow, white chocolate lollipop with black olive and sea salt, pineapple gum drops, and lemon ginger bonbons. We had 2 wonderful desserts. 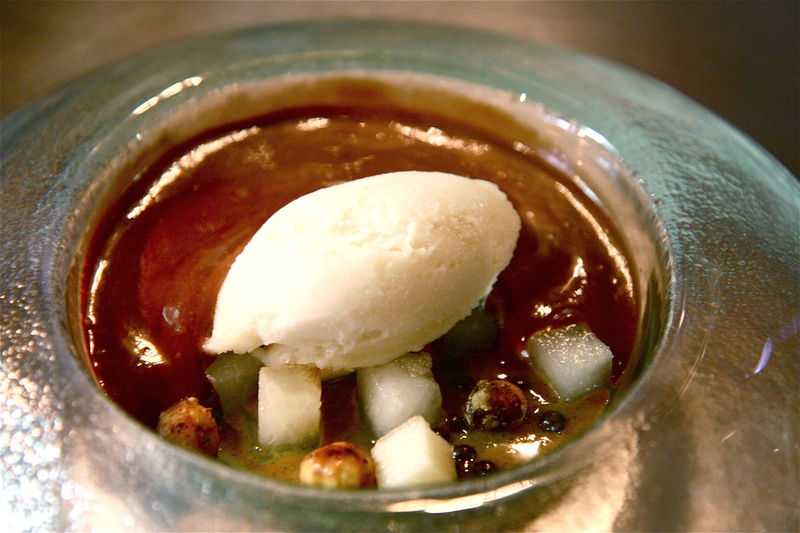 The hot chocolate mousse with pear sorbet and salty hazelnut praline was beautiful. The contrast of warm and cold, smooth liquid and juicy solid fruit was delightful. 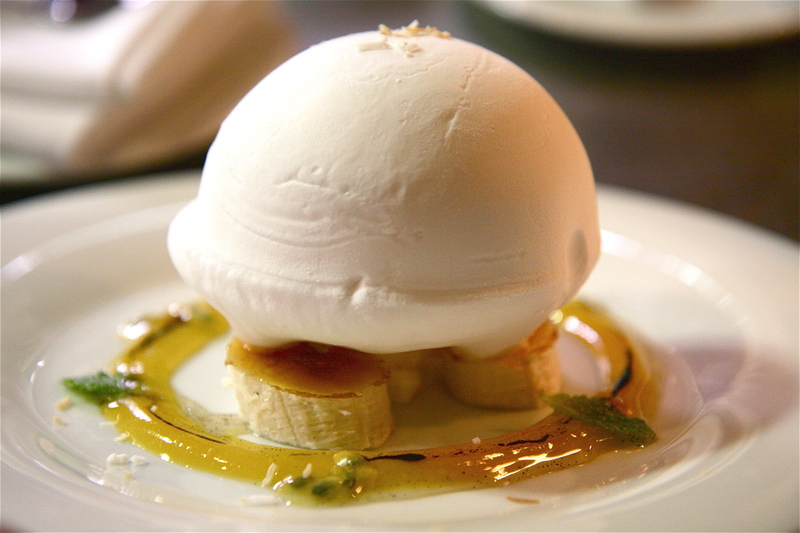 But my big surprise for the evening was the floating nitro coconut island with passion fruit, banana and vanilla. WOW, amazing. The external shell of the white coconut sphere that is hard frozen with nitrous instantly collapses into the molten center with the spoon. The textures of the external shell and the internal goo is wondrous, and the passion fruit seeds explode with tart crunchiness. 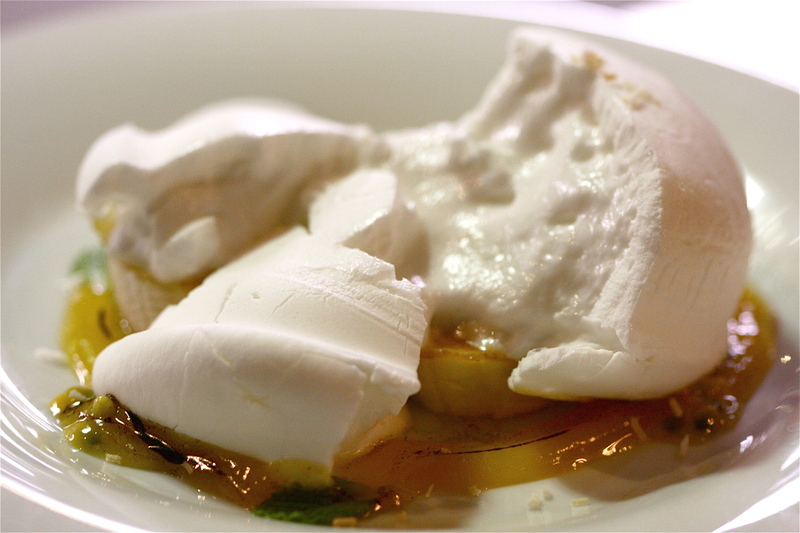 This dessert was really fun to eat, and I had a big smile on my face as I approached it from all angles with my spoon. Our evening at The Bazaar was fantastic, superb, delightful and fun. The service was impeccable, the wine selection thorough, the Starck interior design genius, and the food amazing. It was a thrilling and inspiring adventure into a magical culinary world, and a wonderful sampling of traditional versus modern gastronomy. Random trivia: Did you know that couscous has twice as much fiber as an equal portion of oatmeal?